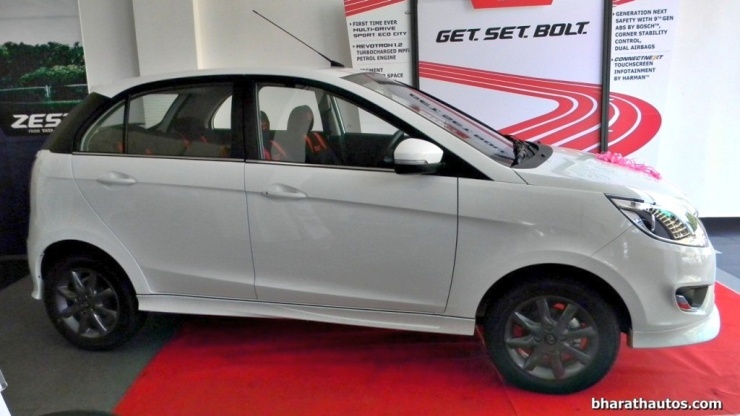 The Tata Bolt B+ segment hatchback is all set to be launched later today. The car with a sporty body kit has been spotted at a dealership, indicating that option is likely to be served up after the hatchback’s launch today. The Bolt’s body kit consists of bumper inserts at the front and the rear, side skirts on the flanks, a hatch lid spoiler and contrast finished alloy wheels. 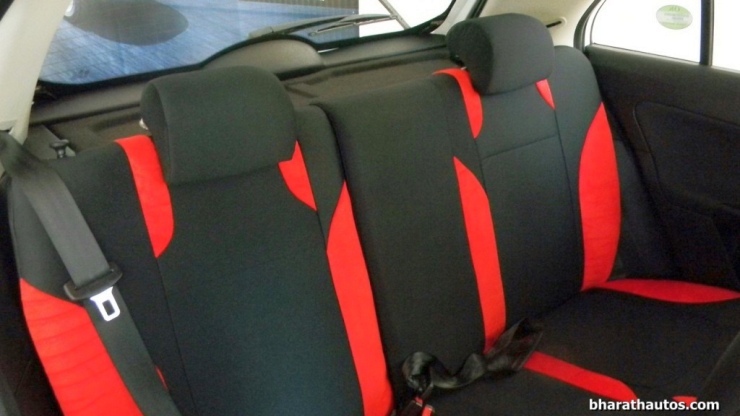 On the inside, changes are limited to sporty fabric covers for the seats. The body kit is expected to be priced at about 30,000-40,000 rupees, and is likely to be available at all Tata car dealerships around the country. Tata Motors offers two, four cylinder engines on the Bolt in petrol and diesel trims, both of them turbocharged. 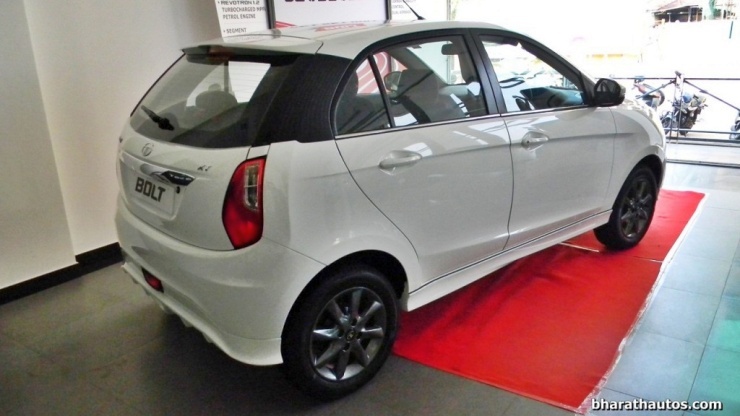 While the 1.2 liter REVOTRON petrol unit is borrowed from the Zest and makes 88 Bhp-140 Nm, the 1.3 liter Fiat Multijet diesel motor is from the base variant of the Zest Diesel, in 74 Bhp-190 Nm state of tune. Both engines use 5 speed manual transmissions. A 5 speed automated manual transmission is likely to be offered on the diesel powered Bolt in the months to come. The unavailability of this option at the time of launch may be attributed to shortage of AMT units. The Bolt is based on the X1 platform that it shares with the Vista. However, the top-hat and interiors are all new items, seeking to highlight the new, bold direction that Tata Motors is taking. Better fit and finish levels distinguishes the new hatchback from its predecessor. The car gets a slew of segment leading features, including the multiple drive modes on the petrol powered version, a touchscreen infotainment interface and smartphone based navigation interface. 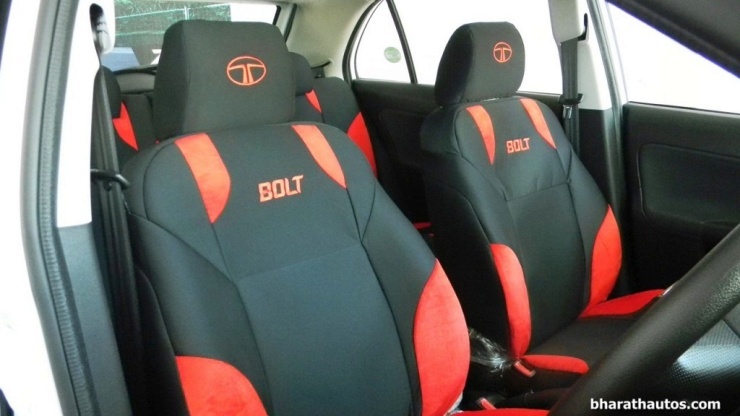 The Bolt will be Tata Motors’ premium hatchback offering with the Vista relegated to serve in the cab market. Pricing will be an important factor that decides the Bolt’s sales performance in India. 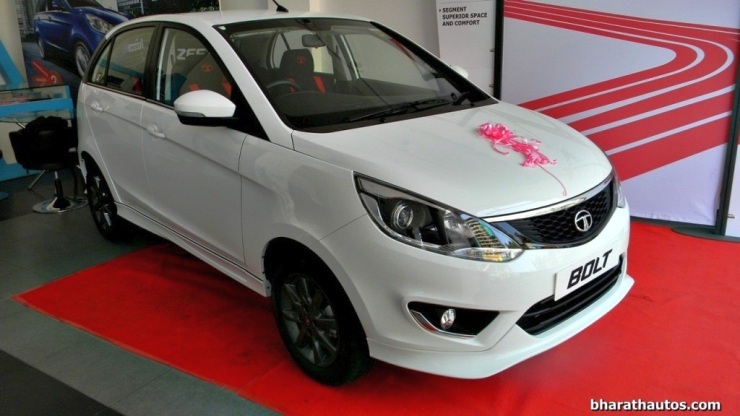 As Tata Motors has already raised expectations by launching the Zest compact sedan with a stunning, introductory price tag, a similar pricing strategy is expected for the hatchback. a starting price between 4-4.2 lakh rupees will be bang on the money, as far as value pricing is concerned. Tata for its part, has gone on a Bolt-specific hiring spree at its company owned Concorde dealerships, anticipating big demand for its latest offering. Watch this space for live updates from the launch.